What a week! There’s been a lot of anxious anticipation. For a few days I wondered if we would even be here today. Perhaps, I thought, we’d be living out of suitcases somewhere higher and dryer. We have been spared from Florence. We must pray for those in the path of the storm and remember our obligations to help out as they rebuild. 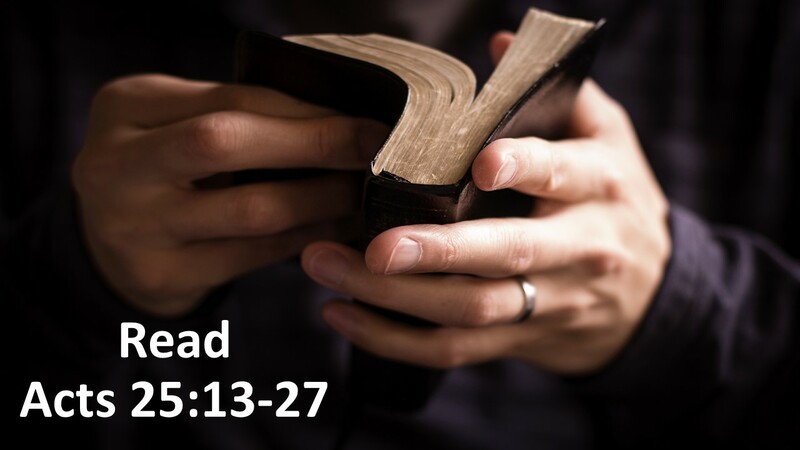 Waiting in anticipation is what Paul has been doing as we work our way through the closing chapters in Book of Acts. Last week, we saw that Paul appealed his case to the Emperor, to Caesar. He knew the dangers of returning to Jerusalem and decided to stick it out with the Roman leadership. We’d think that Paul would be placed on a ship for Rome right away, but that doesn’t happen. Luke, the author of Acts, lingers. There’s a problem. Festus needs to indict Paul. 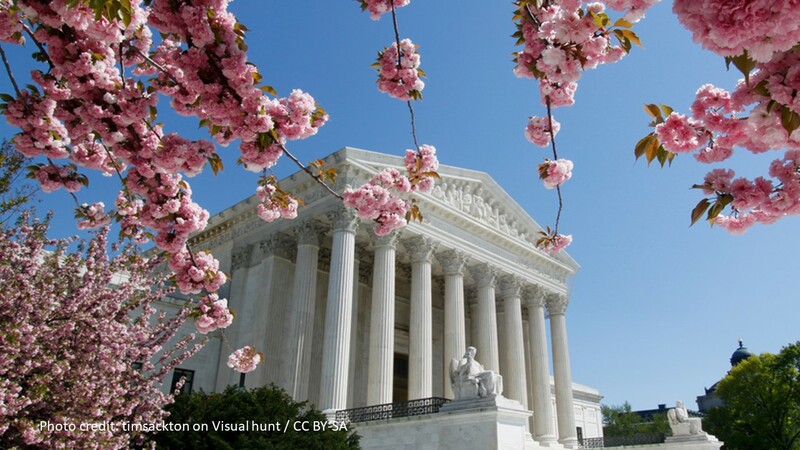 Think of it this way, someone who’s not been convicted of a crime can’t go before the Supreme Court. Likewise, if Festus packs Paul off to Rome without some kind of charge, Caesar and the Romans are not going to be amused. They might take it out on Festus. 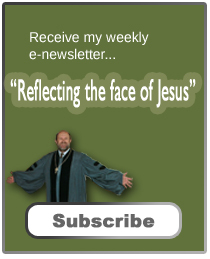 As Festus ponders this, he’s visited by a neighboring king, another Herod. We’ve heard that name before, haven’t we? Luke seems intrigued by this family. There’s a parallel in Luke’s writings between Paul’s court appearances and those of our Lord. In his gospel, Luke tells about the attempts of Roman officials to avoid passing sentence on Jesus, a man they didn’t think deserved to die. 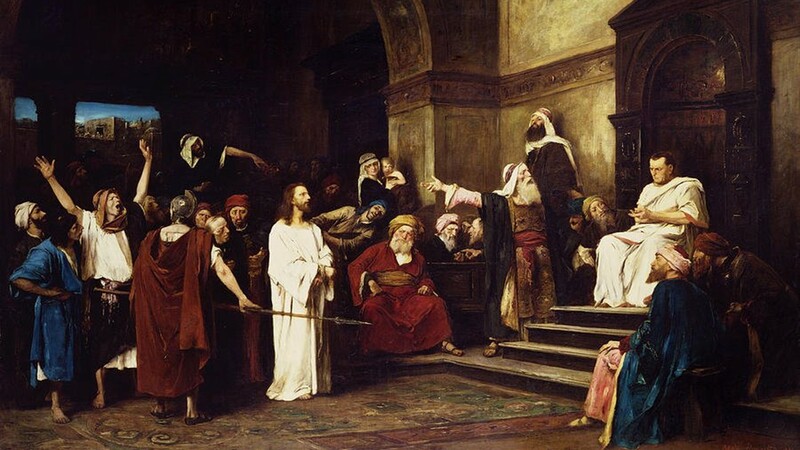 As we heard earlier, Pilate tries to pass the buck by having Herod judge Jesus, but the King sends Jesus back to Pilate. They can’t find anything serious enough to charge Jesus. But they are interested in keeping the peace. If that means Jesus has to die, so be it. Sadly, such “collateral damage” doesn’t bother us as long as we can make it “one of them.” Human nature hasn’t changed. Look at our wars. We don’t fight other humans. We fight terrorist, Gooks, Japs, Krauts… When we can name someone as the other, we depersonalize them and are less bothered when there is a miscarriage of justice. So Jesus, to the Romans, was just another Jew, therefore expendable. But with Paul, things are different. Yes, he’s another Jew, but he’s also a Roman citizen. With his citizenship comes certain rights. They can’t unjustly accuse and execute him as a way to appease the crowds. So Festus has to figure out what to do, and he calls on Herod Agrippa II. Read Acts 25:13-27. We’ve all heard the phrase, “pass the buck.” We all, at one time or another, have probably used this phrase. It means to pass our responsibility off to someone else. The term, I’ve learned, comes from playing poker in the American West. 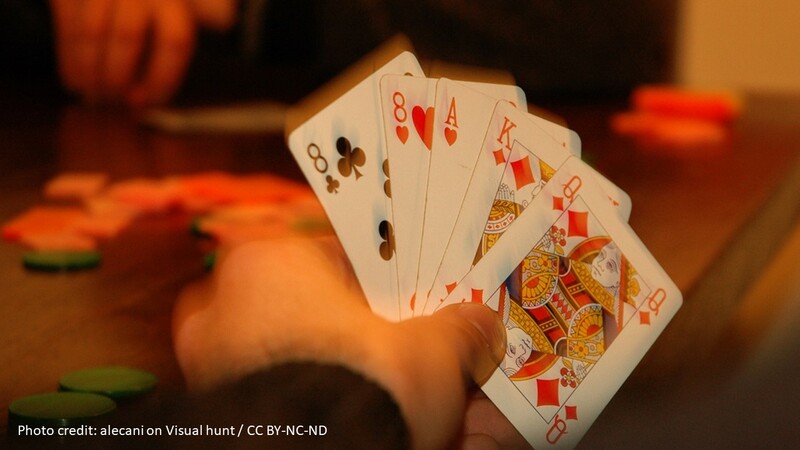 When you had the same person dealing cards, it was easier for them to cheat, so each hand the dealer would change. To indicate who the dealer was at the table, a buck knife would often be stuck in front of them. Originally called a buck-horn knife, later it was shortened to a buck knife, so named because the handle was made from an antler. So when someone didn’t want to deal, he could “pass the buck” and move the knife and cards over to the next player, who would become the dealer. A little warning for those of you who play poker at the clubs. Do not stick a knife in the table. That may be frowned upon. This ain’t the Old West. Of course, this phrase that started in a card game changed over time. Language is fluid. 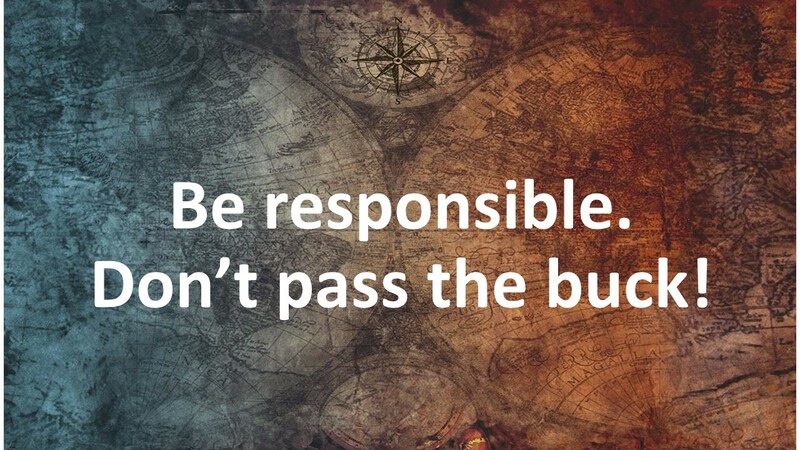 Passing the buck began to be applied to someone who passes his or her responsibilities on to someone else. Passing the buck, that’s what we see happening with Paul. No one wants to take responsibility. Lysias, the Roman tribune in Jerusalem, could have let Paul go. So could have Felix. Both could have seen to it that justice was served, but they passed the responsibility on. Now we see Festus attempting the same thing. Our passage today begins with a royal visit. King Agrippa and Bernice arrive. As neighbors, they probably came to pay their respects to the new ruler over Caesarea and Judea. Let me say a little bit about these two, for the Roman soap opera continues. Several weeks ago, we heard about Felix and his rather loose wife, Drussilla. Well, let’s now see if you can keep this straight. King Agrippa, whose father was Herod Agrippa whom we met earlier in Acts, along with his queen Bernice and Drussilla, are siblings. Did you catch it? 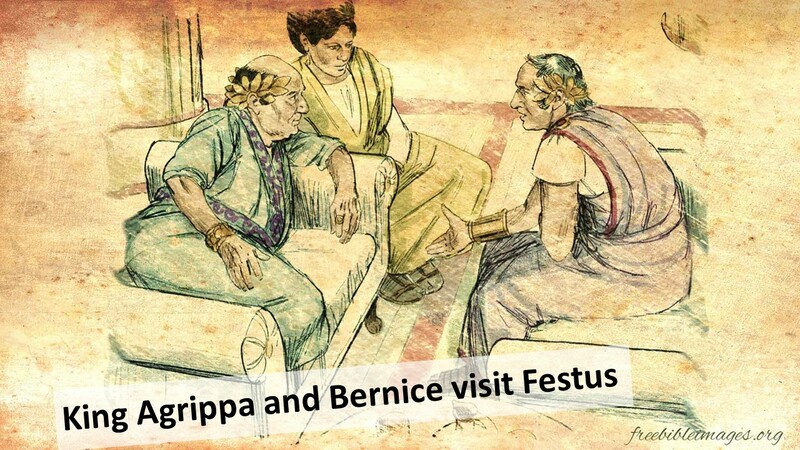 Agrippa, Bernice and Drussilla, all have the same dad. We only think our world is scandalous. Luke doesn’t go into the scandals, but Roman historians did. A brother and sister together like that… Later Bernice would move up the food chain as she shack up with Titus, who led the Roman armies when they reconquered Jerusalem. She became his wife, but when he became emperor in the year 79, she was dismissed because the Roman people were horrified about her past. At this time, she’s with her brother and we don’t know what to make of their relationship. Perhaps Luke, who seems to be interested in placing all that happens within the church into historical context, assumed folks reading this account in the first century would understand the scandal just by mentioning their names. So King Agrippa and Bernice stop by for a royal visit. For Festus, this is a chance for him to learn what he can do about Paul. Notice that at the beginning of the reading, Festus attempts to place blame on his predecessor. 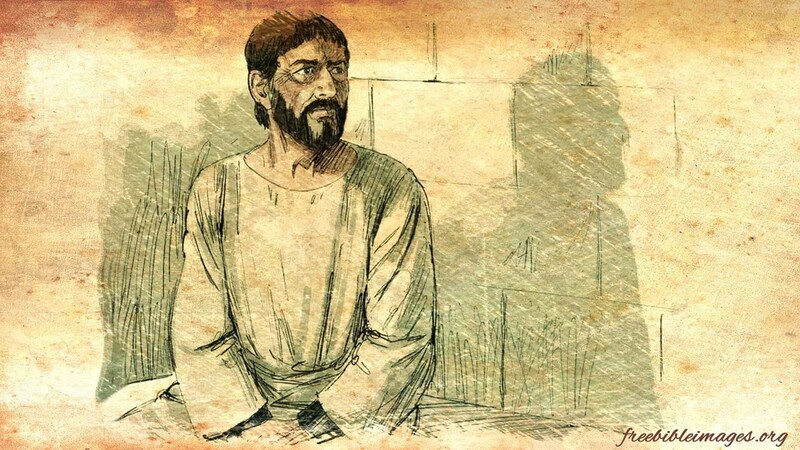 “Herod,” he said, “Felix left this dude named Paul in prison. And now he has appealed to Caesar. I’m not even sure what to do. In my opinion, he’s not guilty.” Herod, it appears, obviously had heard of Paul and is intrigued. He wants to learn more. 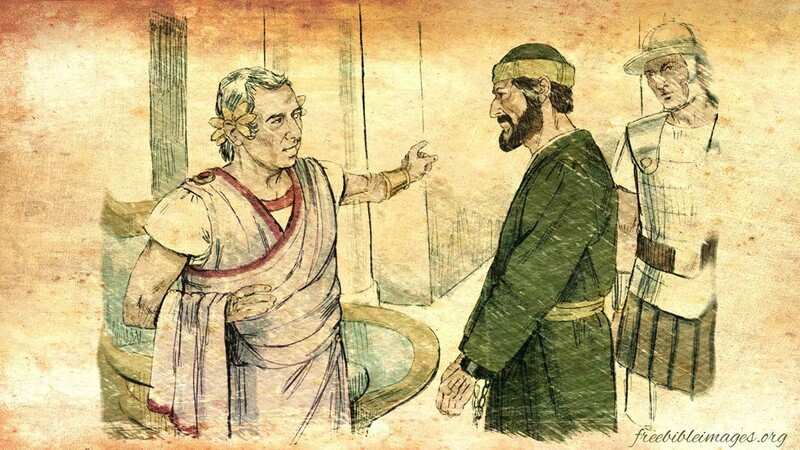 With experience in governing, Herod is willing to hear Paul and offer Festus advice. Starting with verse 23, we’re given the details of this royal gathering before whom Paul is to be dragged. This could be a movie set. Everyone that anyone is there, dressed in their finest. There’s the military brass standing at attention, there are the leading citizens, and the king and queen of a neighboring province sit in the middle. We can imagine palm branches and peacock feathers waving as slaves attempt to cool the crowd. This is a big deal. Again, Festus makes his case. If he’s sending Paul to Rome, he has to indicate what charges have been made against him. Festus throws this big party for this purpose. In a couple of weeks, we’ll hear Paul’s speech before Agrippa, which is the last of his great speeches recorded in the Book of Acts. For now, consider what we might learn from this passage? 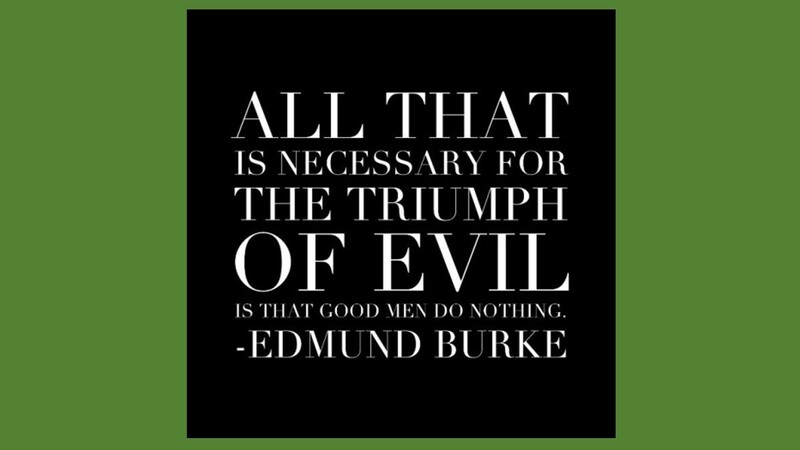 When those who have been vested with power refuse to use such power to bring about justice, then by their inaction, injustice flourishes. 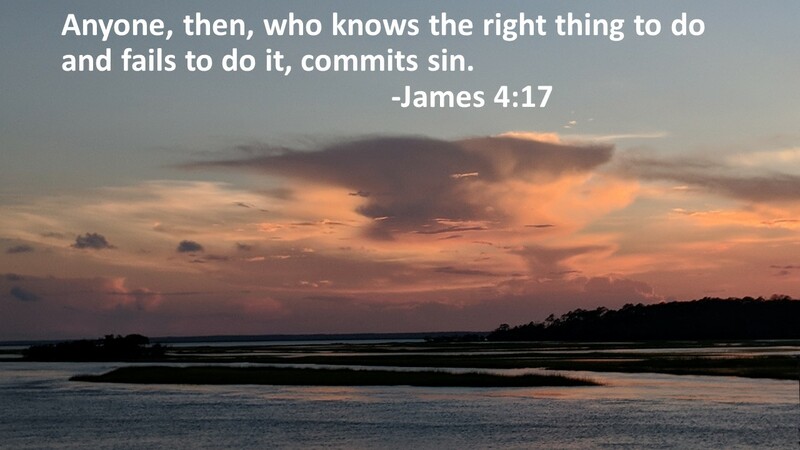 Sin isn’t just what we do. It’s also what we refuse to do. I encourage you sometime to pick up the Westminster Larger Catechism. For each of the Ten Commandments, there are enlightening lists. For the fifth commandment, “thou shall honor thy father and mother,” the list contains not just how we treat our earthly parents, but also our superiors. It also contains sections about how our parents as well as our superiors are responsible to us. Among the sins of the superior toward the inferior is neglecting their duty to those below while seeking our own ease, profit, or pleasure. These are things we’re forbidden to do, but there is equally as large list of things required of us. It has often been said that leadership is a lonely job. But that doesn’t excuse us. Unlike the examples we have of Felix and Festus, we should avoid passing the buck. We must take responsibility. It may cause us to lose friends or influence, as these two feared. But the lives and well-being of others depend on our faithfulness and honesty. 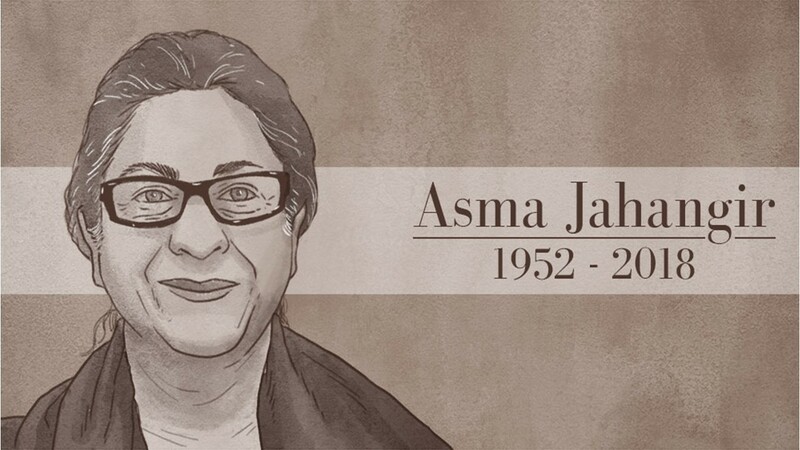 Asma Jahangir was a Pakistani lawyer who died early this year. She was also Muslin. Back in the mid-90s, there was a high profile case in Pakistan, where two Christian men, a father and his 14 year old son, had been convicted in a local court of blasphemy for defacing the Qur’an. They claimed they were not guilty and it appears the whole thing was an attempt by neighbors to claim their land. They were sentenced to die. The cased was appealed to the Pakistani Supreme Court. This was a hot button issue and no one wanted to touch it, until Jahangir stepped forward. Her decision resulted in Islamic clerics condemning her. In their eyes, nothing could be worse than a Muslim woman defending infidels. This resulted in threats and two attempts on her life. Yet, she remained focused and won the case. As soon as the two were released, they were whisked out of the country and safely to asylum in an unnamed European state. What Ms. Jahangir did was to be a responsible and courageous leaders. It’s not the easy way out, but it’s the right way. Too often we look to do what is easy, what won’t cost us or what will help us receive the praise of the crowd. But being a responsible leader is more than seeking the approval of the masses. Being a responsible leader is more than building up one’s base. Being a responsible leader is doing the right thing because it is right. Unfortunately, in these last couple of chapters in Acts, we’ve seen Roman leader after Roman leader avoiding doing what is right. They attempt to take the easy way out. Don’t be like them. When you feel led by God’s Spirit to speak out against injustice, to stand up against corruption, to support the weak, to confront a bully, or to speak the truth, don’t follow Festus’ example. Don’t pass the buck. Stand for what is right. Amen. While Luke doesn’t mention Herod the Great’s massacre of the innocents as Matthew does (Matthew 2), he does mention Herod the Great (Luke 1:5) as well as many who were second and third generation Herods. See Luke 3:1, 19-20; 8:3; 9:7ff; 13:31; 22:66; 22:7ff; and Acts 4:27, 12:1ff, 23:25. F. F. Bruce, The Book of Acts (Grand Rapids, MI: Eerdmans, 1986),481. 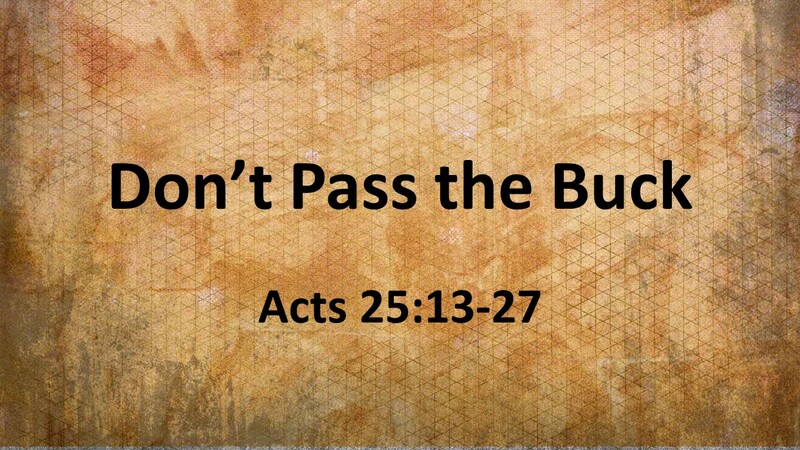 I found the idea of relating “passing the buck” to his passage from a sermon by the Rev. Dr. Peter A. Butler, Jr, “Providential Passing the Buck” delivered at 2nd Reformed Church, Irvington NJ on May 22, 2011. Luke is the one who sets the birth of Jesus during the reign of Augustus, when Quirinius was governor of Syria. See Luke 2:1-2. Beverly Roberts Gaventa, Acts (Nashville TN: Abingdon, 2003), 335-336. Presbyterian Church USA, The Book of Confession, “Westminster Confession of Faith: The Larger Catechism,” Questions 127-130. Carnegie Samuel Calian, The Spirit-Driven Leader: Seven Keys to Succeeding Under Pressure (Louisville, WJK Press,2010), 82-83. Well said. We could use more leaders who are willing to be courageous and stand for what is right instead of passing the buck.